My wife works with children that have multiple, severe disabilities in an area that is pressed pretty hard for funding. Every now and then she and I will collaborate on a part or a tool to help her and the kids she serves along the way. 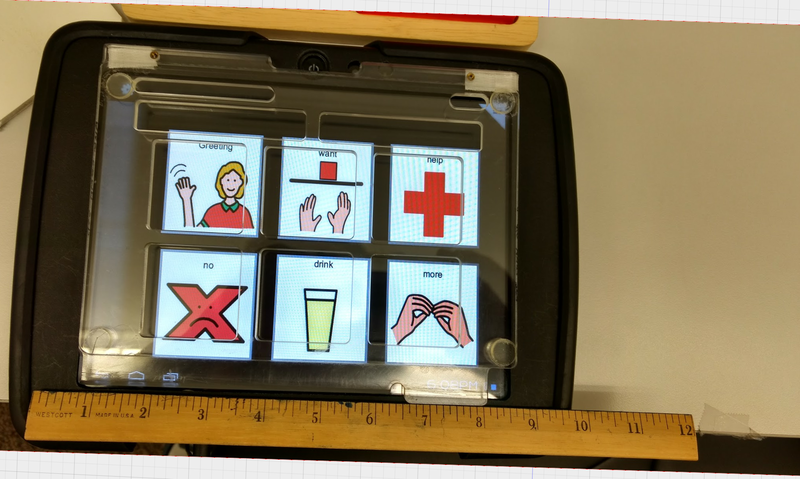 A few weeks ago she showed me this tablet that runs some special software and acts like a communication assistant for a little girl in her room. The tablet comes on and off her wheelchair on a regular basis and is used in a lot of different contexts. Because of some motor issues, it works out best to have a physical divider on the screen so that the buttons that correspond to specific sounds or actions are easier for her to hit. I’m not real clear on what the backstory is with the first divider, but it was pretty rough. It was the wrong size, didn’t line up with the buttons, was very loosely attached causing it to fall off a lot and it was made of clear plexi making it more difficult to distinguish between the buttons. We couldn’t get the device home for me to look at, so I had her take a picture with a ruler in the shot so I could give Fusion 360’s Canvas calibration feature a go. Select a point on your canvas as your starting point, then select a second point as your end point. Fusion will now ask you to specify the distance between those two points. In my case I select the 1 inch mark as my first point, the 2 inch mark as my second point and then specified the distance between my points as 25mm. With the canvas calibrated, now anything that I draw can have specific measurements made which allows me to make up an object for 3d print without having to physically touch the device it’s going to attach to. This was my first time using this feature and I’m very pleased with how it worked out. The finished part fit like a glove, costs all of 15 cents in material and electricity and is far easier to personalize and make into something that better reflects the young lady it’s made for.